Piercings are known to be a thing of beauty. It turns out, there’s more to some of them. Some ear piercings are now said to help heal constant headaches also called migraines. To be specific, daith and tragus ear piercings. But can they really help with migraines and relieving headaches quickly? Which side should you get it to stop headaches; the left ear or the right ear? Here is fact-based information and reviews on the effectiveness of such cartilage piercing s for migraine relief. Dos it help with migraines? It is a specific type of ear piercing that passes through the middle ear’s innermost cartilage. (See pictures below). It is therefore a type of ear cartilage piercing. While some people will get this piercing from a studio near them for beauty reasons, others are doing it as a treatment for persistent headaches. There are claims that this kind of ear cartilage piercing can help relieve migraines. Not much of scientific studies show the direct use of piercings to treat migraines effectively. However, anecdotal evidence and reviews show it is possible to cure migraines with daith piercings. But how does it work? A daith piercing works in the same way acupuncture works to relieve migraines. Both hormonal and stress-related migraines are related to the pressure the patient feels in the ear, temples etc. resulting in headaches. Piercing the ear relieves tension points, thus stopping the migraines. How does the daith piercing work to relieve nagging headaches? The pressure point is located in the cartilage found in the innermost fold of the ear. By piercing this cartilage, the pressure and tension are relieved, this stopping the migraines. Acupuncture techniques work by stimulating nerves in muscle tissues and under the skin. It makes the body produce endomorphs – pain relieving substances. As a result, the body is relieved of any pressure and pain that is causing the discomfort. 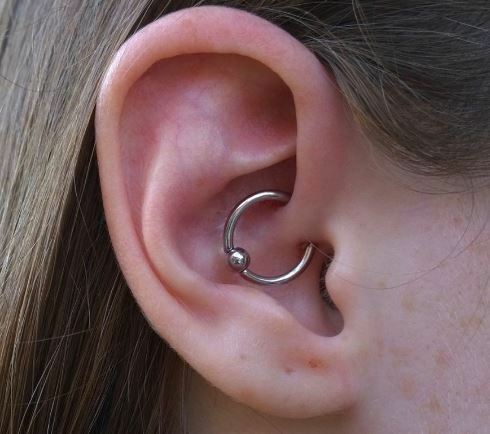 Some acupuncturists prefer embedding a little steel ball in the daith piercing jewelry or inside the piercing for easy and quick relief of headaches. When you feel the signs of migraines, you can push on it to get relief. While there is very little science to support the success of a daith piercing for migraines, those who believe in alternative medicine, as well as the overwhelming social evidence and reviews show that this treatment works. “Acupuncturists target this area during sessions, and many people experience short-term headache relief after treatment” says Dr. Thomas Cohn, a pain relief specialist. Daith piercings for migraines may not work for everyone. Acupuncture points do not produce the same result for every patient. Most health professionals advise that you continue to use migraine medication even after or when planning to get a daith piercing. Which side to get daith piercing for migraines? Migraines can affect one side of the head, or come at random on both sides of your head. Some people are able to relieve migraines by massaging the particular side of the head that suffers the migraines. So, should it be the left or right ear daith piercing for migraines? You can pierce the left ear cartilage if you get the migraines more often on the left side of the head. However, if the pain and pressure occurs most on the right side, do a daith piercing on the right side and see if it will stop the headaches. The best way to determine which side of daith piercings will help migraines is by massaging the ear or head on one side first. If the results are encouraging, get a daith piercing on that side. However, you can also opt to relieve headaches with daith piercings on both sides of the ear. If you are trying to determine which side to get a cartilage ear piercing to stop a migraine or headache, you may also want to see an acupuncturist. The practitioner will help determine whether one piercing on either the left ear or right ear is all you need, or both. This way, your piercing may be a long term solution for your migraines. Acupuncture is a holistic health approach originating from traditional Chinese medicine. 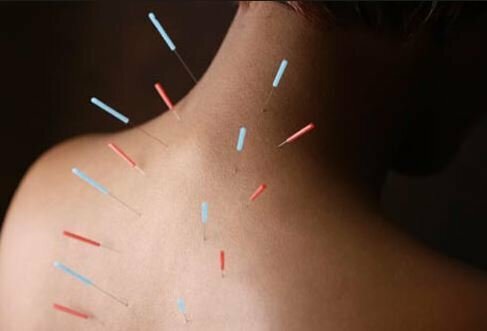 In its practice, acupuncturists insert needles in the skin on specific points on the body at varying depths to help relieve pain, tension and discomfort. In acupuncture, although needles are inserted on the body, the practice is pain-free. The connection between acupuncture and tragus piercings and daith piercings in healing headaches, anxiety and migraines is that a pressure point that is a possible cause of migraines and headaches are relieved. Acupuncture points are located on the meridians through which viral energy runs according to traditional Chinese medicine theory. Clinical trials have shown effectiveness in the use of this technique to stop migraines or at least reduce the frequency of severe headaches and anxiety in a good ratio of patients. It is very important to note that acupuncture helps treat migraine pain in some patients, and not others, just like other medications used to get rid of headaches. Therefore, not everyone will have similar results with acupuncture and daith piercing for migraine treatment. There are a lot of reviews and social testimonials claiming that daith piercings work when it comes to stopping migraines, headaches and anxiety. Here are a few we collected around the web to help with the evidence. Although there are not many clinical studies that show solid evidence explaining how these work, most people have shown that their migraine symptoms have improved since getting the piercing done. My name is Chris I’m 25 and I’ve been dealing with (“Very Severe Migraines”) since I was 12 and they have only gotten worse over the years. I’ve tried about everything you can think of to get rid of these migraines(except: acupuncture/and the daith piercing or piercings). About 2-4 years ago I had a migraine so bad that it lasted for 2 Years straight. *everyday for 2 Years straight non stop* Then out of no where the migraines stopped. Now currently 11/13/17 I’ve been fine up until about 2 and a half weeks ago, I’ve recently started having those same “severe migraines ” I’m always in pain and like I said I’ve tried about everything. * in between hospitals,meds that I don’t like to take because they make me feel worse,diets,botox injections that numbed me up but did nothing for the pain. Even smoked MMJ-which is something that helps me bare with the pain and still do to this very day, trying to get my red card,go get acupuncture done, or even get a piercing or piercings tomorrow etc. I am all out of options as of What to do for my migraines. PS I am already stressed out and have had to deal with and work through it. I have a wife and 2 little beautiful daughters that I have to make sure I provide and take care of my family and sometimes it messes with my job if I have one at that current moment which I just started a good job with my wife so you know I have to show that as a “Man” I need to provide and take care of business.